I was born, Commander of the Faithful, in Bagdad, and was left an orphan while I was yet a very young man, for my parents died within a few days of each other. I had inherited from them a small fortune, which I worked hard night and day to increase, till at last I found myself the owner of eighty camels. These I hired out to travelling merchants, whom I frequently accompanied on their various journeys, and always returned with large profits. One day I was coming back from Balsora, whither I had taken a supply of goods, intended for India, and halted at noon in a lonely place, which promised rich pasture for my camels. I was resting in the shade under a tree, when a dervish, going on foot towards Balsora, sat down by my side, and I inquired whence he had come and to what place he was going. We soon made friends, and after we had asked each other the usual questions, we produced the food we had with us, and satisfied our hunger. 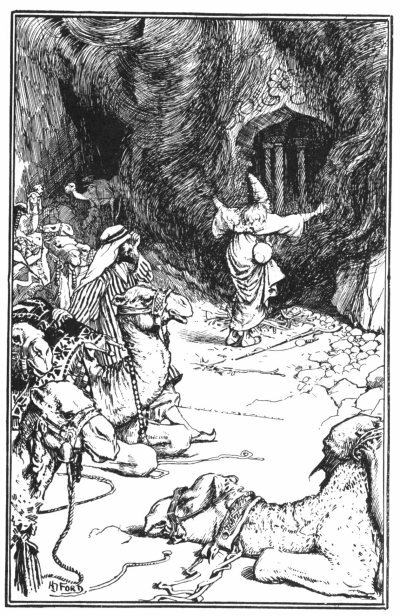 While we were eating, the dervish happened to mention that in a spot only a little way off from where we were sitting, there was hidden a treasure so great that if my eighty camels were loaded till they could carry no more, the hiding place would seem as full as if it had never been touched. 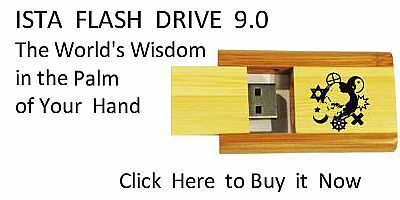 use is the knowledge of this treasure to you? Alone and on foot, you could carry away a mere handful. But tell me where it is, and I will load my eighty camels with it, and give you one of them as a token of my gratitude." Certainly my offer does not sound very magnificent, but it was great to me, for at his words a wave of covetousness had swept over my heart, and I almost felt as if the seventy-nine camels that were left were nothing in comparison. The dervish saw quite well what was passing in my mind, but he did not show what he thought of my proposal. "My brother," he answered quietly, "you know as well as I do, that you are behaving unjustly. It was open to me to keep my secret, and to reserve the treasure for myself. But the fact that I have told you of its existence shows that I had confidence in you, and that I hoped to earn your gratitude for ever, by making your fortune as well as mine. But before I reveal to you the secret of the treasure, you must swear that, after we have loaded the camels with as much as they can carry, you will give half to me, and let us go our own ways. I think you will see that this is fair, for if you present me with forty camels, I on my side will give you the means of buying a thousand more." I could not of course deny that what the dervish said was perfectly reasonable, but, in spite of that, the thought that the dervish would be as rich as I was unbearable to me. Still there was no use in discussing the matter, and I had to accept his conditions or bewail to the end of my life the loss of immense wealth. So I collected my camels and we set out together under the guidance of the dervish. After walking some time, we reached what looked like a valley, but with such a narrow entrance that my camels could only pass one by one. The little valley, or open space, was shut up by two mountains, whose sides were formed of straight cliffs, which no human being could climb. When we were exactly between these mountains the dervish stopped. "Make your camels lie down in this open space," he said, "so that we can easily load them; then we will go to the treasure." I did what I was bid, and rejoined the dervish, whom I found trying to kindle a fire out of some dry wood. As soon as it was alight, he threw on it a handful of perfumes, and pronounced a few words that I did not understand, and immediately a thick column of smoke rose high into the air. He separated the smoke into two columns, and then I saw a rock, which stood like a pillar between the two mountains, slowly open, and a splendid palace appear within. But, Commander of the Faithful, the love of gold had taken such possession of my heart, that I could not even stop to examine the riches, but fell upon the first pile of gold within my reach and began to heap it into a sack that I had brought with me. The dervish likewise set to work, but I soon noticed that he confined himself to collecting precious stones, and I felt I should be wise to follow his example. At length the camels were loaded with as much as they could carry, and nothing remained but to seal up the treasure, and go our ways. Before, however, this was done, the dervish went up to a great golden vase, beautifully chased, and took from it a small wooden box, which he hid in the bosom of his dress, merely saying that it contained a special kind of ointment. Then he once more kindled the fire, threw on the perfume, and murmured the unknown spell, and the rock closed, and stood whole as before. [paragraph continues] Balsora, and I to Bagdad. We embraced each other tenderly, and I poured out my gratitude for the honour he had done me, in singling me out for this great wealth, and having said a hearty farewell we turned our backs, and hastened after our camels. I had hardly come up with mine when the demon of envy filled my soul. "What does a dervish want with riches like that?" I said to myself. 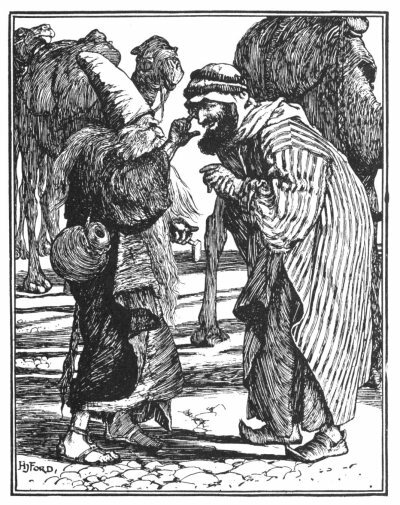 "He alone has the secret of the treasure, and can always get as much as he wants," and I halted my camels by the roadside, and ran back after him. I was a quick runner, and it did not take me very long to come up with him. "My brother," I exclaimed, as soon as I could speak, "almost at the moment of our leave-taking, a reflection occurred to me, which is perhaps new to you. You are a dervish by profession, and live a very quiet life, only caring to do good, and careless of the things of this world. You do not realise the burden that you lay upon yourself, when you gather into your hands such great wealth, besides the fact that no one, who is not accustomed to camels from his birth, can ever manage the stubborn beasts. If you are wise, you will not encumber yourself with more than thirty, and you will find those trouble enough." "You are right," replied the dervish, who understood me quite well, but did not wish to fight the matter. "I confess I had not thought about it. Choose any ten you like, and drive them before you." I selected ten of the best camels, and we proceeded along the road, to rejoin those I had left behind. I had got what I wanted, but I had found the dervish so easy to deal with, that I rather regretted I had not asked for ten more. I looked back. He had only gone a few paces, and I called after him. anybody who intends to keep together a troop of thirty. In your own interest, I feel sure you would be much happier if you entrusted ten more of them to me, for with my practice it is all one to me if I take two or a hundred." As before, the dervish made no difficulties, and I drove off my ten camels in triumph, only leaving him with twenty for his share. I had now sixty, and anyone might have imagined that I should be content. But, Commander of the Faithful, there is a proverb that says, "the more one has, the more one wants." So it was with me. I could not rest as long as one solitary camel remained to the dervish; and returning to him I redoubled my prayers and embraces, and promises of eternal gratitude, till the last twenty were in my hands. "Make a good use of them, my brother," said the holy man. "Remember riches sometimes have wings if we keep them for ourselves, and the poor are at our gates expressly that we may help them." My eyes were so blinded by gold, that I paid no heed to his wise counsel, and only looked about for something else to grasp. Suddenly I remembered the little box of ointment that the dervish had hidden, and which most likely contained a treasure more precious than all the rest. Giving him one last embrace, I observed accidentally, "What are you going to do with that little box of ointment? It seems hardly worth taking with you; you might as well let me have it. And really, a dervish who has given up the world has no need of ointment!" Oh, if he had only refused my request! But then, supposing he had, I should have got possession of it by force, so great was the madness that had laid hold upon me. However, far from refusing it, the dervish at once held it out, saying gracefully, "Take it, my friend, and if there is anything else I can do to make you happy you must let me know." Directly the box was in my hands I wrenched off the cover. "As you are so kind," I said, "tell me, I pray you, what are the virtues of this ointment?" "They are most curious and interesting," replied the dervish. "If you apply a little of it to your left eye you will behold in an instant all the treasures hidden in the bowels of the earth. But beware lest you touch your right eye with it, or your sight will be destroyed for ever." His words excited my curiosity to the highest pitch. "Make trial on me, I implore you," I cried, holding out the box to the dervish. "You will know how to do it better than I! I am burning with impatience to test its charms." The dervish took the box I had extended to him, and, bidding me shut my left eye, touched it gently with the ointment. When I opened it again I saw spread out, as it were before me, treasures of every kind and without number. But as all this time I had been obliged to keep my right eye closed, which was very fatiguing, I begged the dervish to apply the ointment to that eye also. "If you insist upon it I will do it," answered the dervish, "but you must remember what I told you just now--that if it touches your right eye you will become blind on the spot." Unluckily, in spite of my having proved the truth of the dervish's words in so many instances, I was firmly convinced that he was now keeping concealed from me some hidden and precious virtue of the ointment. So I turned a deaf ear to all he said. "My brother," I replied smiling, "I see you are joking. It is not natural that the same ointment should have two such exactly opposite effects." "It is true all the same," answered the dervish, "and it would be well for you if you believed my word." But I would not believe, and, dazzled by the greed of avarice, I thought that if one eye could show me riches, the other might teach me how to get possession of them. [paragraph continues] And I continued to press the dervish to anoint my right eye, but this he resolutely declined to do. "After having conferred such benefits on you," said he, "I am loth indeed to work you such evil. Think what it is to be blind, and do not force me to do what you will repent as long as you live." It was of no use. "My brother," I said firmly, "pray say no more, but do what I ask. You have most generously responded to my wishes up to this time, do not spoil my recollection of you for a thing of such little consequence. Let what will happen I take it on my own head, and will never reproach you." "Since you are determined upon it," he answered with a sigh, "there is no use talking," and taking the ointment he laid some on my right eye, which was tight shut. When I tried to open it heavy clouds of darkness floated before me. I was as blind as you see me now! "Miserable dervish!" I shrieked, "so it is true after all! Into what a bottomless pit has my lust after gold plunged me. Ah, now that my eyes are closed they are really opened. I know that all my sufferings are caused by myself alone! But, good brother, you, who are so kind and charitable, and know the secrets of such vast learning, have you nothing that will give me back my sight?" "Unhappy man," replied the dervish, "it is not my fault that this has befallen you, but it is a just chastisement. The blindness of your heart has wrought the blindness of your body. Yes, I have secrets; that you have seen in the short time that we have known each other. But I have none that will give you back your sight. You have proved yourself unworthy of the riches that were given you. Now they have passed into my hands, whence they will flow into the hands of others less greedy and ungrateful than you." to my prayers and cries, and I should soon have been dead of hunger and misery if some merchants had not come along the track the following day and kindly brought me back to Bagdad. beggar; and up to this time I have lived solely on the alms that have been bestowed on me. But, in order to expiate the sin of avarice, which was my undoing, I oblige each passer-by to give me a blow. This, Commander of the Faithful, is my story. When the blind man had ended the Caliph addressed him: "Baba-Abdalla, truly your sin is great, but you have suffered enough. Henceforth repent in private, for I will see that enough money is given you day by day for all your wants." At these words Baba-Abdalla flung himself at the Caliph's feet, and prayed that honour and happiness might be his portion for ever.